Have you ever heard the expression “good things come in pairs”? Well, that’s certainly the case when it comes to our favourite Embroider Buddy® products. With an Embroider Buddy® for every occasion, one is never enough. And with endless options and combinations to choose from, we’re here to help. Little ones love their Embroider Buddy® friends, no matter their shape or size. Each of them has their own personalized design and special story, making it difficult to leave home without them. That’s why our 26” Embroider Buddy® Backpacks are the perfect pairing of comfort and practicality when you’re on the move! These companions also provide a helping hand while you’re on-the-go. They have hidden compartments with lots of room for storing goodies. Embroider Buddy® Backpacks also have adjustable straps, making them a versatile gift for almost any age. 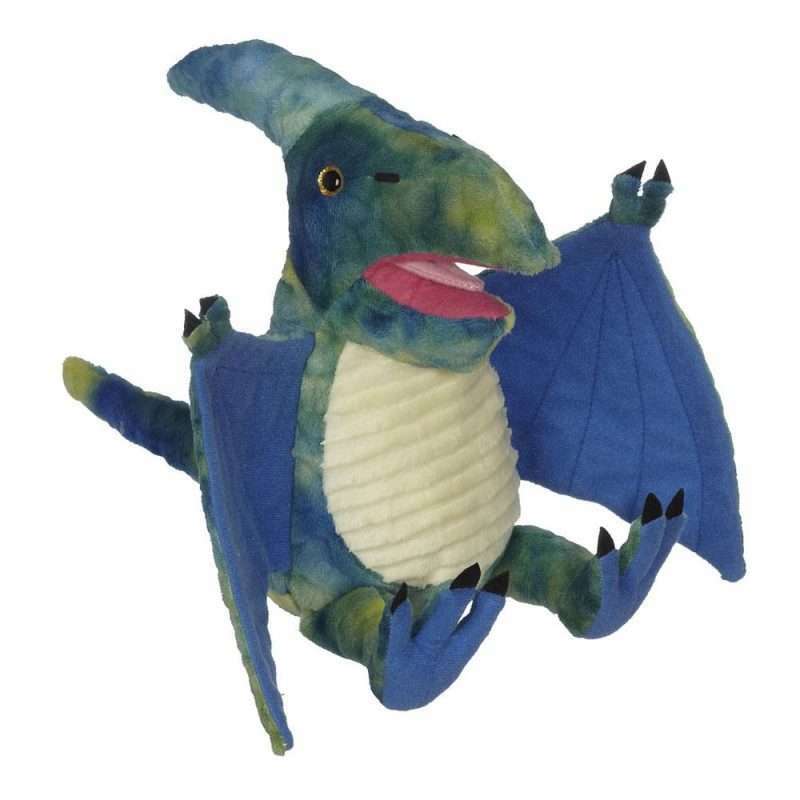 Oh, and let’s not forget – Pierce Dino Buddy is also available as an 8” Cuddle Pal! 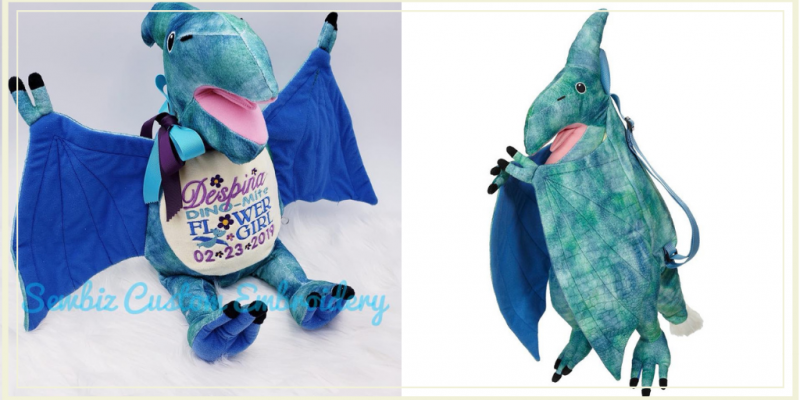 What’s better than a plush Buddy? A Buddy and a Blankey in one! This duo is a perfect gift for the little one in your life. Our Embroider Buddy® Blankeys are a nap-time necessity and make the perfect companion in this chilly winter weather. And twenty inches of snuggle space means lots of room for one-of-a-kind designs. Blankey Buddy Okie Owl, Blankey Buddy Giraffe, Blankey Buddy Rory Lion, Blankey Buddy Pauley Puppy, Blankey Buddy Bunny, Blankey Buddy Montey Monkey and Blankey Buddy Lambton Lamb all have a matching Buddy for pairing! Looking for the trifecta? 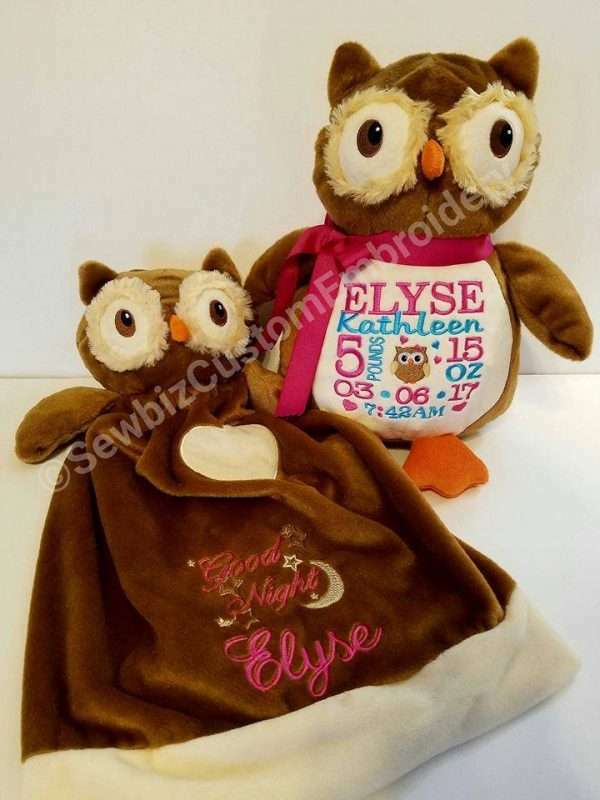 Pair one of our blankey sets (which includes a large 30” x 40” Blankey and a 16” Mini Blankey) with one of their matching Embroider Buddy® friends! Some of our favourite Buddies have a mini version, like Buster Bulldog Buddy and his 9” Cuddle Pal Bulldog friend who looks just like him. Cuddle pals are available through our Parkdale Novelty site and can sport Whatzupwiththat!® Bearwear, too! So doggone cute. The bigger, the better! Pairing these two together is like peanut butter and jelly, you can’t have one without the other. They make for excellent baby shower gifts. 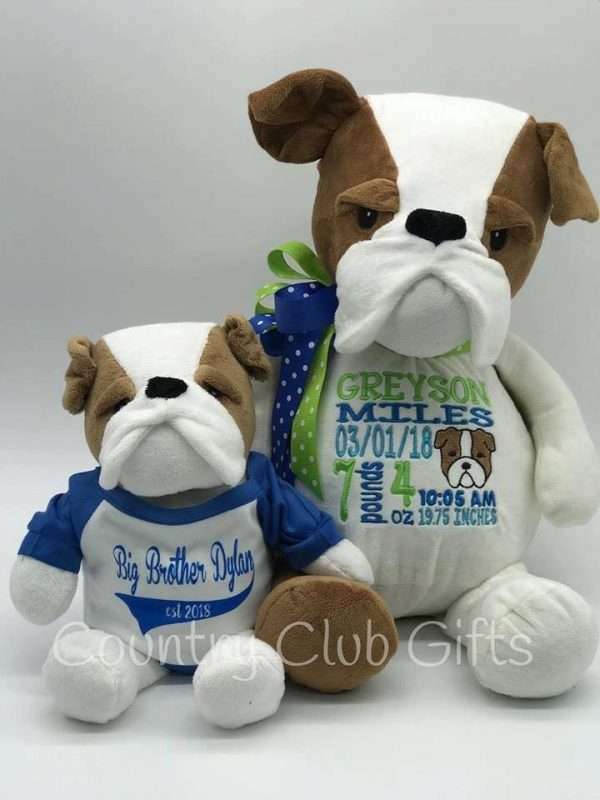 Include the older sibling(s) by gifting a Jumbo Buddy personalized with “Big Brother” or “Big Sister” and watch them light up the room! 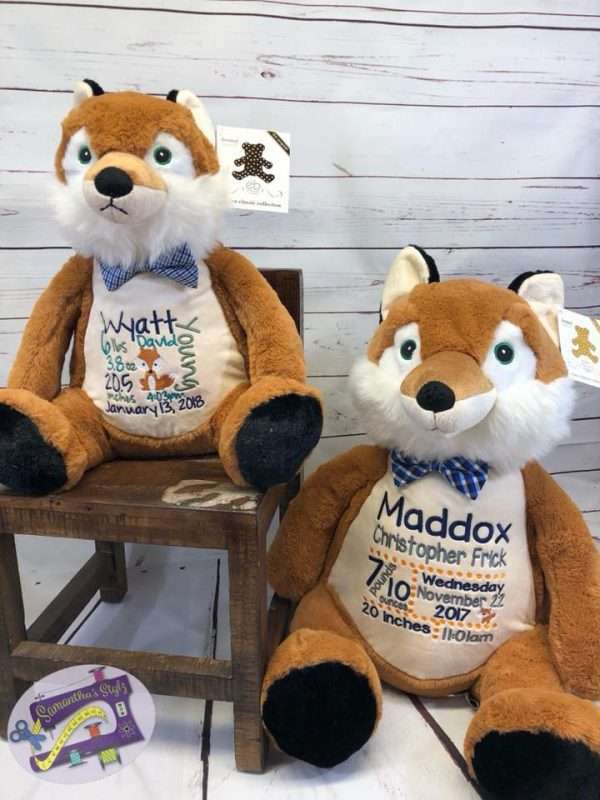 Dalton Buddy Dog, Bella Buddy Bunny, Benjamin Buddy Bear, Mason Buddy Moose and Frederick Buddy Fox are all available in 22” jumbo sizes and are super sweet when paired with their 16” counterpart. Embroider Buddy® products are made of embroidery-friendly, low-pile plush fabric and exceed all applicable U.S., Canadian, and European safety standards.